Spotlight Spotlight Business of the Week for 10/02/17 is John Crawford and Associates! Spotlight Business of the Week for 10/02/17 is John Crawford and Associates! The Spotlight Business of the Week for 10/02/1 is John Crawford and Associates! This week we spotlight another longtime business in Carterville. 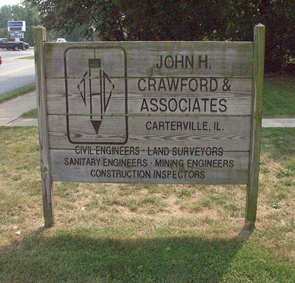 The Civil Engineering and Land Surveying firm of John H. Crawford & Associates, PC, was founded in 1972 by John H. Crawford, P.E., L.S. Since then, we have expanded to additional offices in Gillespie (1989) and Vandalia (2012). As of 2013, long-term employees Rodney Potts, PE, and Donnie Smoot have purchased the business. Today we have 11 full-time full time employees, state of the art CAD equipment, and a goal of cost effective, professional services for our clients.